Comfortable lounge area with open log fire, fireside library, piano and guitar. Underfloor heating: All bedrooms and living areas have underfloor heating. 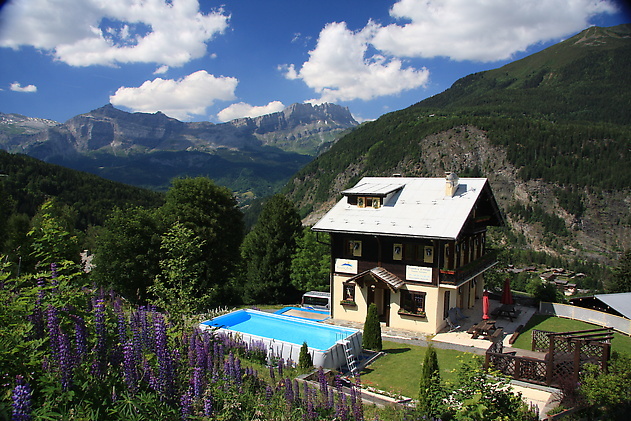 Spectacular 360° mountain views of the Mont Blanc massif. Dining area with gorgeous round Oak table that seats up to 10 guests. 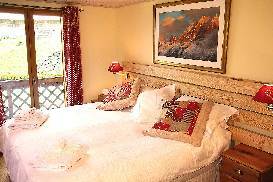 Flat screen tv with UK satellite, surround sound with a multimedia entertainment system with over 1,800 movies including many ski videos. High-speed internet - free unlimited wi-fi throughout the chalet. Heated ski room with dedicated 10 pair ski boot dryer to dry your boots every night. 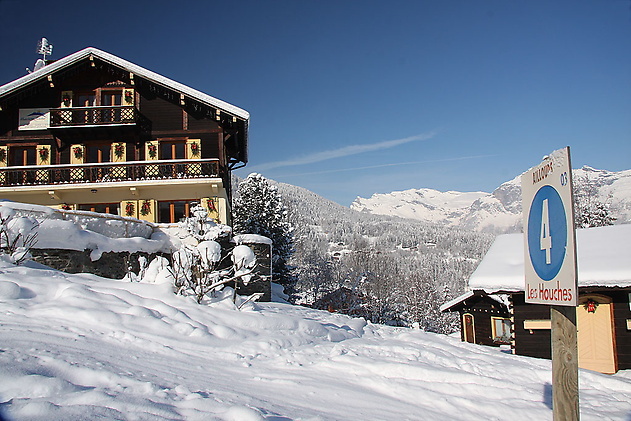 Dedicated concierge service to arrange ski hire, pre-book your lift passes, arrange private ski lessons with the best instructors, or guides, in-room massage, tandem paragliding flights, snow-shoeing, husky dog sledding, or even helicopter flights. 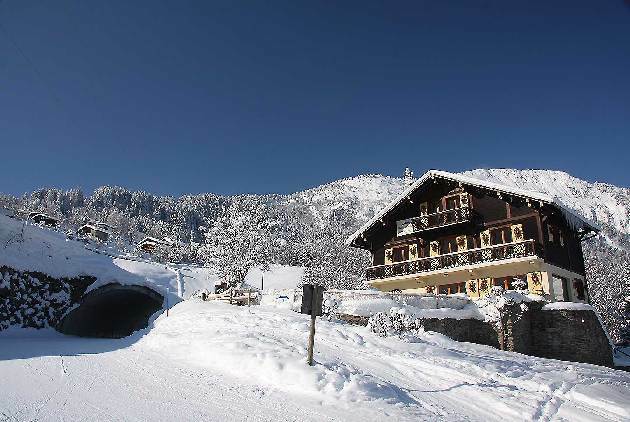 You wll love the BEST benefit of Chalet Alice: its location directly on the ski piste! 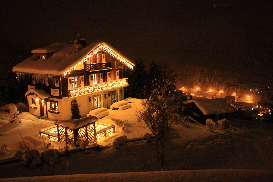 Chalet Alice is special: it is one of the very few chalets in Chamonix valley that offer true ski-in ski-out. 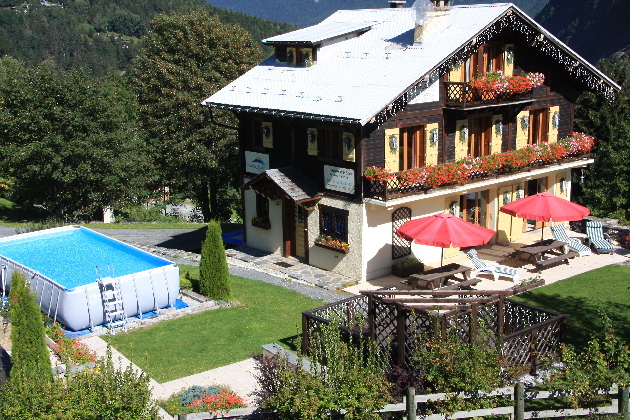 There is probably no better location for skiing in Chamonix valley than Chalet Alice. 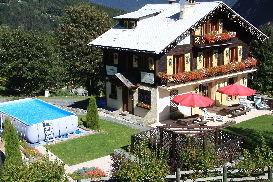 It is perfectly situated, directly on a main blue piste in Les Houches. You can even see the blue piste marker in the photo. 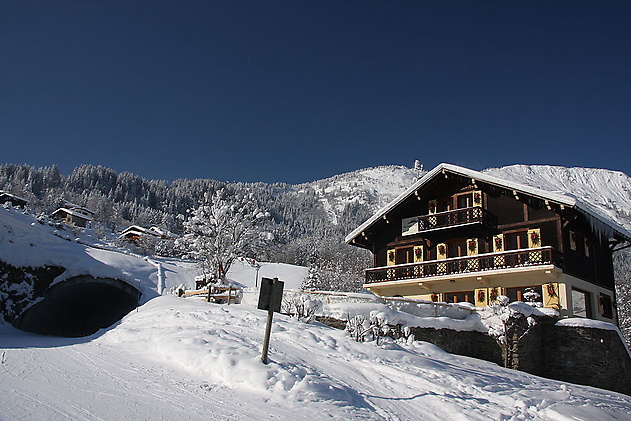 That is how close Chalet Alice is to the piste! 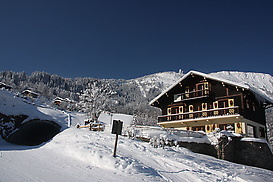 As a place to ski in Chamonix valley, Les Houches is ideal for beginners, intermediate skiers and mixed ability groups because of its pretty, wide, tree-lined ski runs which are mostly blues and reds. For the adventurous, there are two blacks, including the infamous Kandahar, or "Piste Verte", which is the Chamonix World Cup Downhill run. Should Chamonix have poor weather or poor visibility, the place to ski is Les Houches because the tree-lined runs here give you extra visibility. You can be ensured a fantastic, relaxing time. After a great ski day, you can relax those tired limbs with a long soak in the outdoor hot tub, drinking a glass of Champagne amidst the bubbling waters at 39.5°c. This is especially pleasurable if you time your soak to coincide with the sunset. The snow and rock capped mountains of Chamonix all turn a spectacularly rich shade of burgundy. Or perhaps you would prefer to flush those toxins out of your system with a stress-busting sauna. Relax as your muscles unwind. Tension fades. Feel the steam leaving you invigorated, as you enjoy hearing the music from your iPod played from the speakers in the sauna. Or perhaps you would prefer to simply chill out in the lounge. 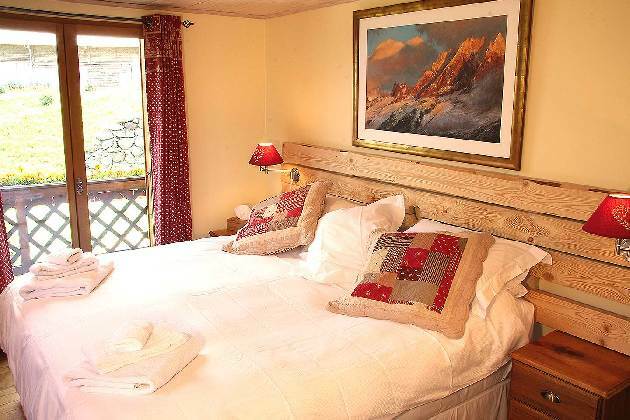 Read your favourite book, spread out on the large sofa in front of the roaring open log fire. You can either bring your own book, or enjoy one from the fireside library. Chalet Alice has hundreds of books to choose from. 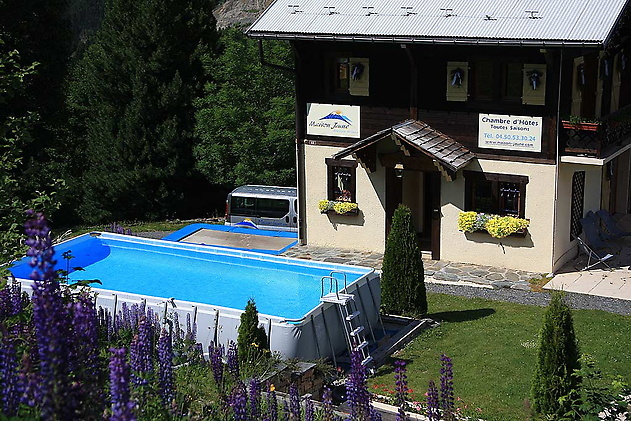 If you want to keep up with the news, the chalet has high-speed free unlimited Wi-fi, and UK satellite television. 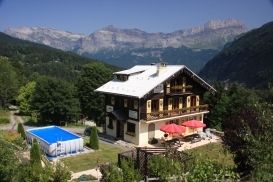 If movies or video are your thing, Chalet Alice has a large flat-screen tv and surround sound. It has a bespoke multimedia system with on-demand access to over 1,800 movies, and dozens of ski movies. You can even watch YouTube videos on the big screen in the lounge as well as playing your iPod or iPhone. All five bedrooms are spacious with underfloor heating with individual room controls. This means you can control how hot your bedroom is at night, and when you step out of bed on a cold Winter's morning, your feet are nice and toasty. 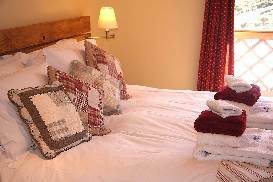 Four of the bedrooms are ensuite with heated towel rails. One room has its own shower room just adjacent. The master bedroom has a separate bath and shower. 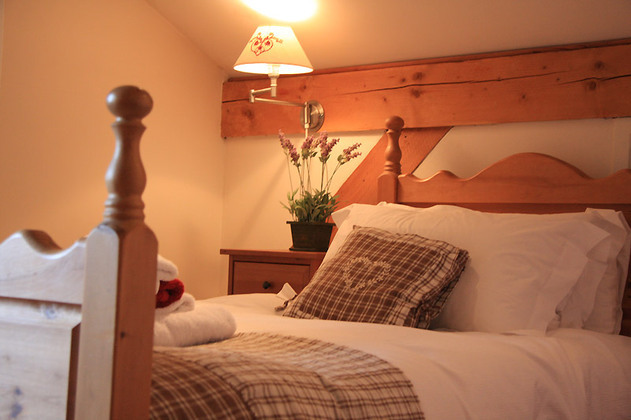 The beds are extremely comfortable with Egyptian cotton linens. Four-season duvets and plump feather pillows ensure you will be warm enough for the coldest Winter's night. 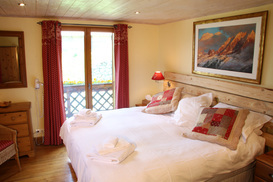 If you suffer allergies, Chalet Alice can supply hypoallergenic duvets and pillows. Two cots and two high chairs are also available for your convenience if you have infants. If you are a keen chef, you will enjoy cooking at Chalet Alice. Its spacious kitchen is well equipped. It has a Paul Bocuse 5 burner hob, with two full size ovens. Loads of pots and pans and roasting trays. There is a dishwasher, microwave, food processors, two fridges, and everything that would enable a chef to enjoy this home-from-home. 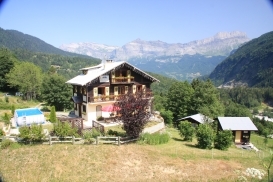 In addition to all the benefits of Chalet Alice as a self-catered chalet, it is possible to rent the chalet for a fully catered ski holiday. 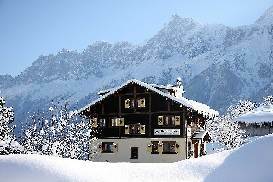 Free Daily Transfer Service to the Other Chamonix Ski Stations. The owners at Chalet Alice understand that people will want to experience ALL that Chamonix valley has to offer. So, in addition to ski in, ski out, when you choose to stay at Chalet Alice catered, they also offer a free daily transfer service to the other ski stations in Chamonix valley. This ensures that you have the optimum snow conditions and you make the most of your lift pass. You even have an option to go through to Courmayeur in Italy for the day's skiing. So, if you are the type of person that likes complete control over where and when you ski, Chalet Alice is for you. Chalet Alice was a top three finalist in the Chalet Chef competition organised by The Times in 2010. 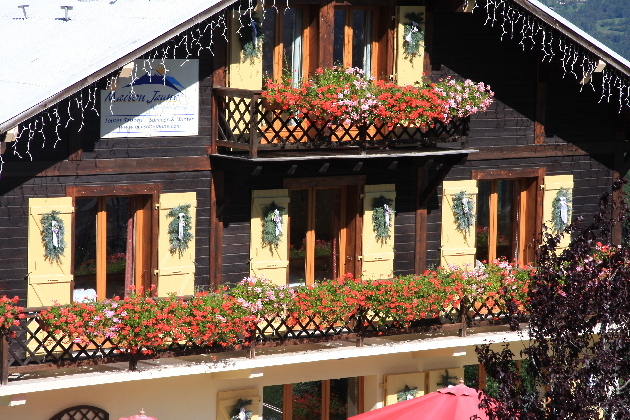 The owners who run the chalet personally LOVE food, and delight in preparing meals that you will love too. 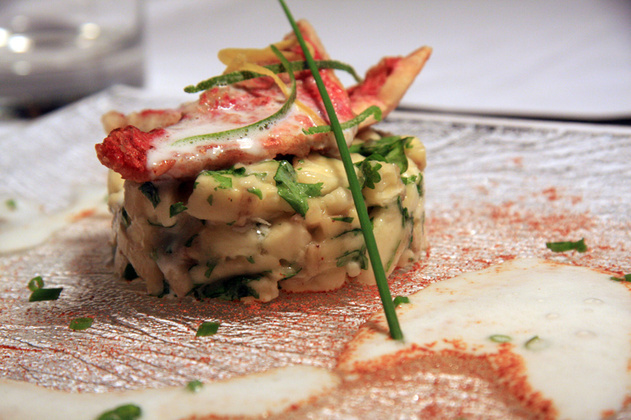 In 2010, their guests entered them in a chalet chef competition for chalets across Europe, where they placed in the top three in the final: a cook-off held in London before a panel of judges including Michelin-starred chef, Tom Aikens. Before you arrive, you will be asked about your food preferences to ensure that the food they cook during your stay suits your group's tastes and requirements. Any allergies or food intolerances will be taken into account. Pan-fried fillets of Red Mullet on a Banana and Coriander Salsa served with a Lemongress, Malibu and chilli sauce. Pan-seared scallops, served with onion confit, scallop tartare, with a white chocolate velouté and lumpfish caviar. Roast Duck breast with a port and cherry sauce, with Potato Dauphinois and Green beans caramelised with Cherry Tomatoes. Pan-fried potato-topped filet of Cod, served with oven-roasted ratatouille. Homemade Orange and Szechwan Pepper Ice cream served with miniature Cointreau jellies and Oranges flambéed in Cognac. Orange and Yogurt soup with Thyme ice cream. Baked Glazed Lemon Tart served with a shot of Limoncello. Owner-operated, the hosts have been personally running Chalet Alice since 2004. That is nearly fourteen years giving their guests fantastic memories, and they delight in providing that personal attention and service that will make your holiday special. If you are not sure where you want to ski on any particular day, no sweat! 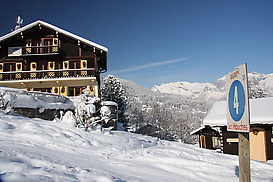 The owners can advise you on the best places for your group to ski given the existing snow and weather conditions, and willingly take you to ensure you have the best holiday possible. With over 20 years experience in Chamonix valley, you can be sure that you will be skiing in the right place whatever the weather! The owners are passionate about their business - and take a hands-on approach to ensuring the success of your holiday. This comes across through their remarkable attention to detail and the way they take care of you. 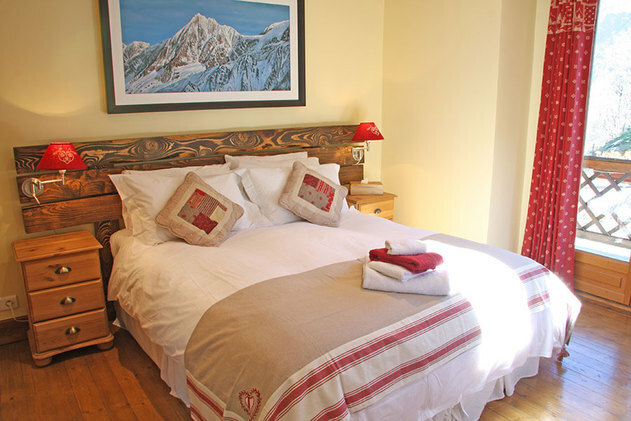 They truly care and will do everything to ensure that you experience the best holiday you possibly can..
Click for Prices and Availability for Chalet Alice now. 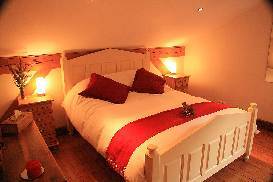 To book now, please see our prices and availability tab above. 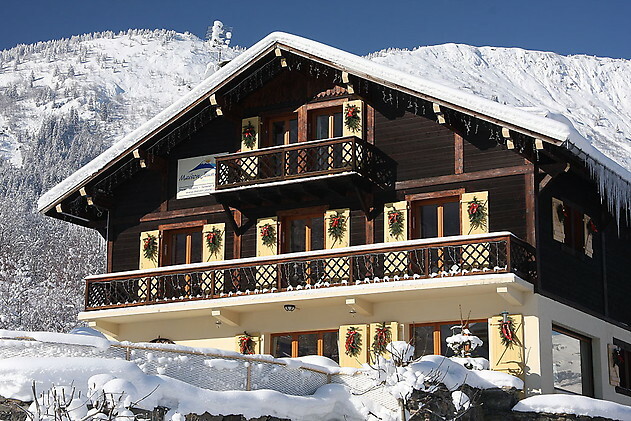 For other enquiries, please send an enquiry through using the form below or call Chamonix Ski Chalets on +44 (0) 845 460 0606. 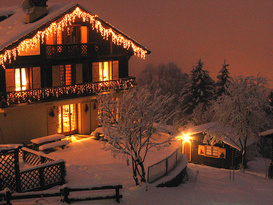 Chalet Alice: Celebrating fourteen years of giving guests fantastic memories!!!! Available on a sole occupancy basis only. 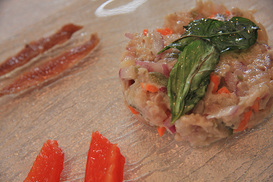 Prices are based upon 8 guests catered. Additional charges for extra guests apply. Winter only, Summer on request discount on second week in Summer - contact for details. Helen and Leighton were so welcoming from the minute we arrived. Part of our group arrived very late and they came back to welcome them too. They were so accommodating in every way, gave us lots of advice and local tips, helped us make bookings and worked around our schedule completely. 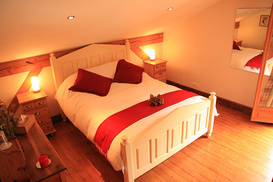 The chalet was toasty warm, really clean and brilliantly designed for a diverse group. All the bedrooms have their own bathrooms, the beds are really comfy and the linen used was beautiful. 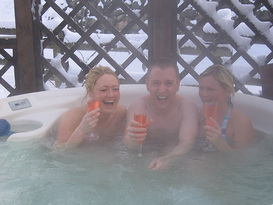 The hot tub was available for use as and when we wanted as was the sauna. The boot room works brilliantly and a fantastic location for ski in ski out. Superbe séjour chez Helene et son mari. Le chalet est super, bien équipé. Les chambres sont spacieuses et les salles de bains nombreuses. Très confortable. Super le jacuzzi extérieur. Helene et son mari ont su répondre au moindre problème avec une grande rapidité. Nous avons passé de très belles vacances en famille. 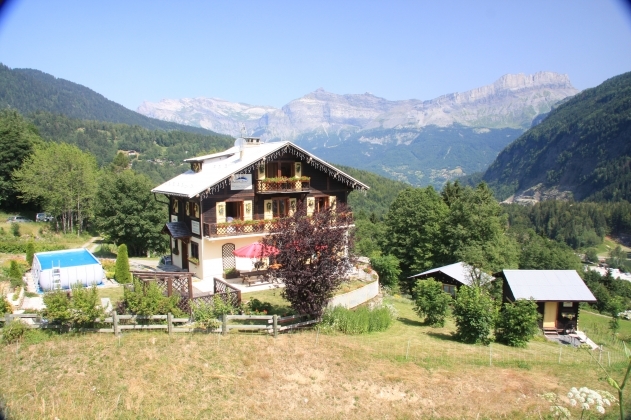 Cannot recommend Chalet Maison Jaune more highly. Great location, excellent rooms and amenities that made for a fantastic stay. Helen and Leyton [sic] were approachable and helpful hosts. We thoroughly enjoyed our time there. 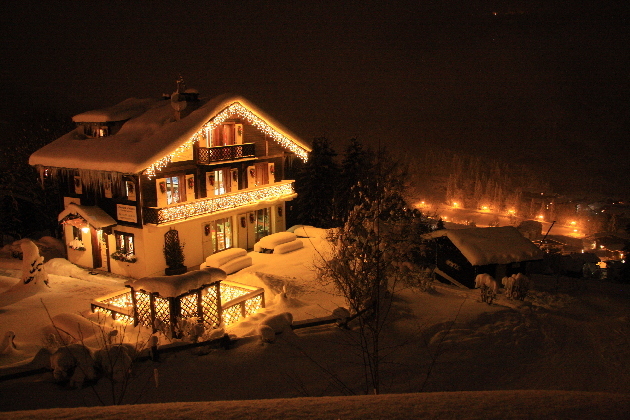 The Chalet was amazing. Helen literally couldn't have been a better host and even helped us plan a considerable amount of our activities and logistics. Everything in the pictures is better in person and there's nothing more fun than skiing into the chalet and relaxing in the hot tub. Can't recommend this enough! This charming, spacious traditional Chamonix chalet is right on the slopes and is perfect for families, friends and corporate groups. 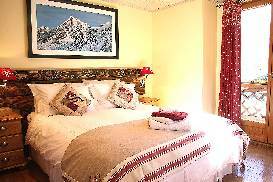 The skiing is right to the front door, so please call us for more details and availability.